Healthy Seas is organizing various side events in Malta, linked to this important global event. The range of unique and exciting activities include (1) Sea clean-up action by volunteer divers at Marine Protected Areas around Malta, (2) “Our Ocean, Our Life” public engagement event and school programme, and (3) Ghost Net Exhibition at the Malta National Aquarium. After the United States of America and Chile, the European Union is hosting the 4th edition of the ‘Our Ocean’ conference, at the initiative of High Representative of the EU for Foreign Affairs and Security Policy Federica Mogherini and European Commissioner for Environment, Maritime Affairs and Fisheries Karmenu Vella. Healthy Seas and its partners are organizing various side events in Malta, at the heart of the Mediterranean, linked to this important global event. A group of volunteer divers from Ghost Fishing and local divers from Malta will depart between 1-3 October every day early in the morning to remove marine litter, more specifically lost fishing gear and ghost nets from ecologically important areas around Malta. Lost fishing gear can cause a lot of problems for marine wildlife and marine ecosystems, but also for the maritime industry, navigational safety, beach quality, local communities and fishermen too. Afterwards, the collected material will be cleaned, sorted and used for awareness raising purposes through an exhibition which will be opened on 4 October at 14:00 at the Malta National Aquarium. Invitation to the Press: The Press is invited to be on board on one of the diving boats and experience these challenging sea clean-up actions from the first raw. Education, awareness raising and involvement of schools are key things in order to spread the word about marine litter and the importance of clean and healthy seas. A coastal and shore clean-up combined with an educational and information event will take place on the 1st of October in Balluta Bay, targeting the general public and schools. The clean-up activities will run from 9:00 until 12:00 with the collecting of materials, followed by the sorting which will be done by 12:30-13:00. Afterwards, a ca. 30 minutes presentation will be given about waste and the impact on the marine environment. Topics include: marine litter, ghost nets, plastics, recycling, circular economy, marine protection. Invitation to the Press: The Press is invited by 11:30 to Balluta Bay to capture images of the event and make interviews. On 4 October at the World Animal Day, we tribute to all those animals who died and suffered because of lost fishing gear and ghost nets. An eye-catching sculpture of Poseidon (King of the Seas) will be created by a local artist, Jennings Falzon. The ghost nets and other marine litter used for this sculpture have been collected by volunteers from the coastline and seas around Malta, including the sea clean-up activities between 1-4 October. The purpose is to raise awareness about the problem of the seas caused by the ghost nets and all the marine litter. It is like a tragedy, a desperate cry of the sea, a cry with no voice to make people think and become alert. We are honored to welcome the organizers of the ‘Our Ocean’ Conference and the delegation of the European Commission to the opening of the Exhibition. Special thanks to João Aguiar Machado, Director-General for Maritime Affairs and Fisheries who will inaugurate the Exhibition. The Ghost Net Exhibition will be on display at the Aquarium for 3-4 weeks. Afterwards it will travel to other locations in Malta for awareness raising. Invitation to the Press: The Press is invited to the opening of the Exhibition at 14:00 at the Malta National Aquarium. The events are organized by Healthy Seas in cooperation with Ghost Fishing, Sharklab – Malta and Zibel. We thank to our sponsors and supporters, who made all these activities possible: Aquafil S.p.A., SkyParks Business Centre, European Commission DG MARE – MARITIME AFFAIRS & FISHERIES, Malta National Aquarium, FMAP – Federation Malta Aquaculture Producers, Maltaqua. For more information visit: www.ourocean2017.org or download the press release below. 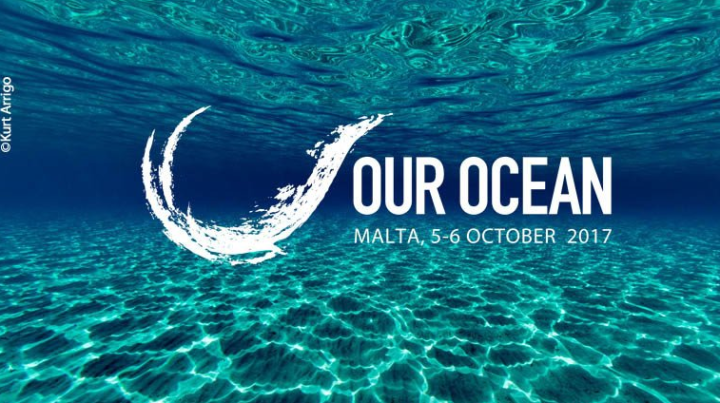 Share the post "HEALTHY SEAS SIDE EVENTS AT THE ‘OUR OCEAN’ CONFERENCE IN MALTA"